Hacienda Xcanatún boasts a rich history, with its magnificent structures dating back to 1789. A fixture within the Colonial period of the Yucatan's reign, the reenvisioned property features 18 stunning guestroom and suite accommodations for its guests to enjoy, with many offering spacious terraces, elegant living room spaces, and more. Stepping outside of the hotel's doors allows guests to marvel at the lush gardens bordering the property, which include tropical flora and a vibrant wildlife population, from fish, to song birds, to tall-standing palm trees. With a close proximity to the finest attractions within Merida and beyond, guests can delight in exploration dictated by their unique preferences. A variety of natural treasures, sites of historical ruins, and tourist attractions dot the landscape, with adventure just moments away from the hotel. Leisure travelers can delight in sundrenched beaches, a masterful golf course, and the property's freshwater pools and serene Spa. The hotel's Casa de Piedra restaurant is renowned within the area and features Yucatecan cuisine infused with flavors of the Caribbean. For an unforgettable getaway in Mexico, Hacienda Xcanatún offers travelers the quintessential locale for rejuvenation. 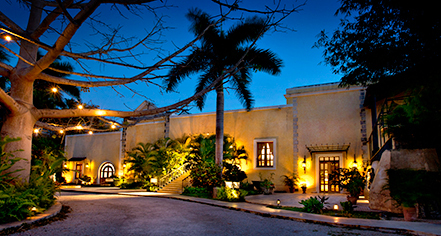 Hacienda Xcanatún, a member of Historic Hotels Worldwide since 2015, dates back to 1789. Hacienda Xcanatún's original vision was dreamed up by Jorge Ruz Buenfil, son of world-renowned archaeologist Alberto Ruz Lhuillier. 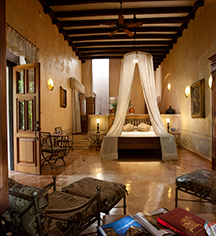 Hacienda Xcanatún boasts a rich history, with its magnificent structures dating back to 1789. A fixture within the Colonial period of the Yucatan's reign, the reenvisioned property features 18 stunning guestroom and suite accommodations for its guests to enjoy, with many offering spacious terraces, elegant living room spaces, and more. Learn more about the History of Hacienda Xcanatún .